Max Pudney Profiles Wartime Pilot And Later Minister Of Defence In The 1984 Labour Government, Frank O'Flynn. Retired Air Vice-Marshal And A Former Deputy Chief Of Defence Staff Robin Klitscher Offers His Thoughts On NZ's Current Defence Direction. Peter Cooper Attends A Celebration Of 50 Years Since Neville DUKe First Played The ""Blue Note"". Murray Kirkus Reports On This Well-Received Airshow And Bumps Into Some Old Friends From New Zealand. Additional Photographs By Clive Wikinson And Glenn Alderton. Since Its Beginnings In 1997 With Four Bae Jetstream J31S, Origin Pacific Has Expanded Its Operation Slowly But Surely. Now With Two Dash 8S On Domstic Routes, Peter Clark Catches Up With The Airline And Its Founders. 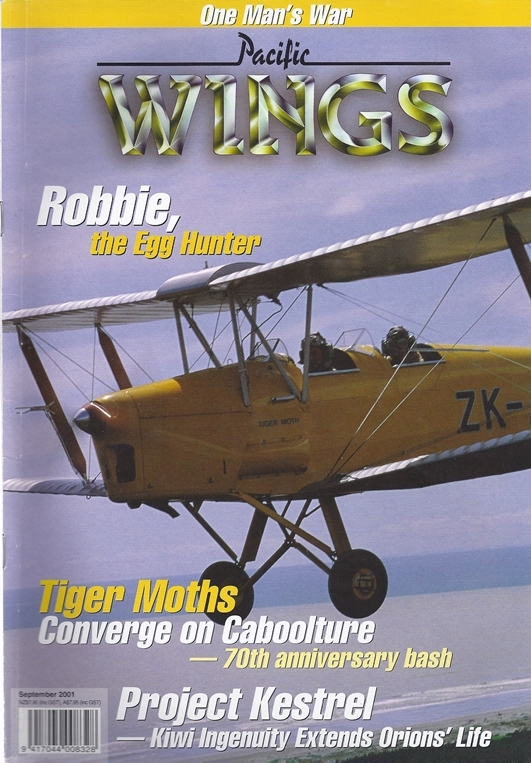 Murray Kirkus Joins The Gathering Of Moth Owners Celebrating The Anniversary Of The Tiger Moth In The Best Tradition Possible Of Geoffrey De Havilland's Creation. How To Save You Country $500M. Judith Martin Reports On The Comletion Of The Rewinging Of The RNZAF's Orion - Project Kestrel.